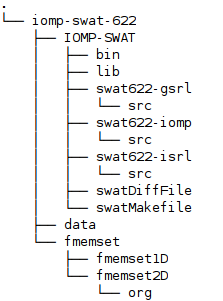 This research work is to accelerate the execution speed of SWAT (version 622, home page http://swat.tamu.edu/) using OpenMP. We achieved more than twice speedup by rapidly nullifying all the variables zero. We provide two example data sets of Upper Colorado (large-scale) and Maui, Hawaii (small-scale), downloadable here. Download: Full Text in RG. Reference data (download) for both Colorado and Maui.